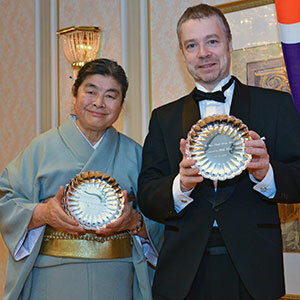 At the 2018 Japan–British Society (JBS) annual gala dinner on 4 December at the Imperial Hotel Tokyo, HIH Princess Akiko of Mikasa presented awards to two big names in bilateral ties. 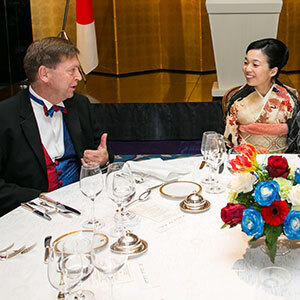 Founded in 1908, “to encourage the study of things British and promote cordial relations between the peoples of the United Kingdom and Japan”, the JBS has about 1,700 members and is supported by Japanese and British firms. 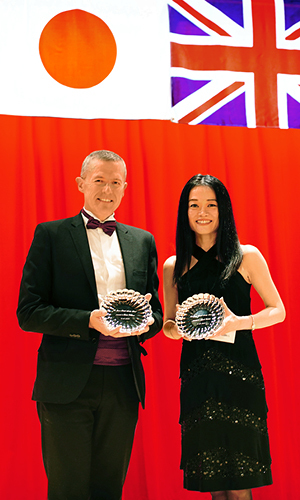 After the guest speech by Hiroshi Nakaso, former deputy governor of the Bank of Japan and president of the Daiwa Institute of Research Ltd., the winners were announced to the 159 guests: Rob Williams, co-founder of fundraising charity cycling team Knights in White Lycra (KIWL), and Royal Ballet Principal Miyako Yoshida OBE. As the one who had nominated Williams, aged 53, for the JBS award, I asked him how it all began: “Overweight and over here about six years ago, I was sitting morosely in a central Tokyo British pub with a few like-minded compatriots discussing football, families and fast-expanding waistlines. Shamefully trying to cover our tragic beer guts spilling over our straining belts, we bantered about how to get fit fast and forever. But we needed more motivation than our own selfish desire to look and feel good. Ironically, the more ale we drank, the better our ideas were and like many Brits, we wanted to tie our efforts to a good cause”. With sad memories of the earthquake and tsunami of 11 March, 2011, still fresh in their minds, the Brits decided to take Norman Tebbit’s much-maligned advice—and get on their bikes. Destination and mission? “Fukushima Prefecture, to raise badly needed funds for the survivors living in tempo­rary accommodation”. Boisterous singing and beer drinking played a part in naming the cycling team Knights in White Lycra (KIWL), after the famous 1960s hit, “Nights in White Satin”, by the UK rock band the Moody Blues. The team members had bonded over the song in a Roppongi karaoke bar just weeks before. It is a name that, Williams says, “we thought we would never use again beyond that one ride”. In April 2013, they cycled 330km to Minami­soma to raise funds for a local project to provide food and water to occupants of tempo­rary accommo­dation. “Elated by the personal achieve­ment and moved greatly by the plight of the survivors and their stoicism, we decided to repeat the ride in 2014. But we rode further, to Minamisanriku, to support the recovery of the town’s children. It was impossible to conceive when we first started KIWL but, six years on, KIWL has raised over ¥52 million for disadvantaged and displaced children in Japan. We are now more than just a cycling group; we also arrange Futsal tourna­ments, marathons, walks, and quiz nights”. The group’s focus now is on raising funds for the some 30,000 abused, neglected and orphaned children living in care homes in Japan. “Through the charity we support, we are able to help facilitate the education of children in digital literacy and computer programming and coding, to give them practical and employ­able skills for adult life. This gives them more hope of a better outcome in adult life, and makes them positive contributors to their local communities in Japan. “This year’s 500km ride on June 13–16 is all about the word ‘new’: new route, new charity (www.youmewenpo.org) and new riders. We are particularly keen to involve more women and I am delighted we have a good number who have already applied for the ride. We also seek corporate sponsors to place logos on the jerseys of our 45 riders. One hundred percent of donations benefit YouMeWe, and from a CSR perspective it promotes the positive idea of getting fit and giving back”. 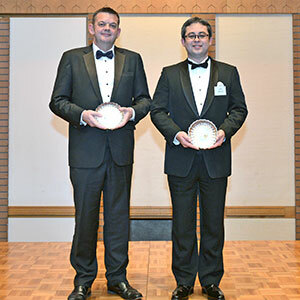 “I accept this award not as an individual, but on behalf of all the men and women—British, Japanese and others—who have generously participated in our activities over the years, the corporate sponsors who have so generously supported our efforts, and the individual donors themselves, who have supported the participants. This award is for all of them. 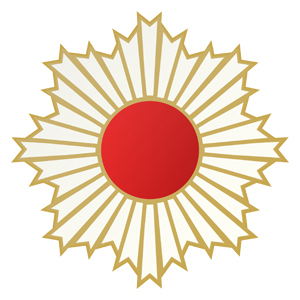 I am greatly humbled to receive such a prestigious award in the presence of Her Imperial Highness Princess Akiko of Mikasa. Thank you very much”. 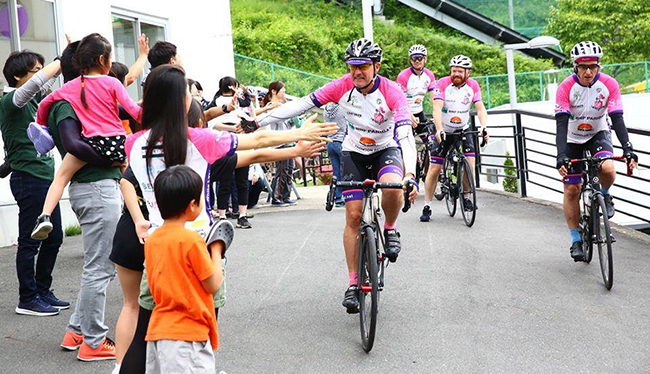 Rob Williams and 36 other bikers visited an Iwate Prefecture children’s home after a 500km ride in June 2018. Miyako Yoshida, aged 53, has performed as a principal—the highest level of ballet in the UK—for 22 years, including 15 years at the Royal Ballet. In addition to pleasing audiences and inspiring young dancers of both genders and nations, Yoshida has taught and mentored the next generation of dancers, notably through the TV series Super Ballet Lesson, where she passed on the UK style of classical ballet choreography. Born, raised and trained in Tokyo, Yoshida won the Prix de Lausanne in 1983 and later joined the UK’s Royal Ballet School. In 1984, she joined the Sadler’s Wells Royal Ballet, in 1990 renamed the Birmingham Royal Ballet, and was promoted to principal in 1988. The following year, she was honoured with the Global Award and the Arts Encouragement Prize for Artists by the Japanese Ministry of Education, Science, Sports and Culture (since 1988 known as the Ministry of Education, Culture, Sports, Science and Technology). In 1995, Yoshida joined The Royal Ballet as principal dancer and is known for her partner­ship with such stars as Tetsuya Kumakawa and Irek Mukhamedov. She was appointed UNESCO Artist for Peace in 2001 and, three years later, married Takashi Endo, a Japanese football agent. In 2006, Yoshida joined Japan’s K-ballet Company—which holds about 50 events each year—while continuing to dance with The Royal Ballet, before winning the UK’s National Dance Award for Best Female Dancer. In 2007, she was appointed to the Order of the British Empire for services to dance. In 2010 she retired from the Royal Ballet at Covent Garden. The New National Theatre Tokyo announced last year that she had agreed to be its artistic director for ballet and dance from September 2020.